Only 2 1/2 minutes – fast-paced and beautiful. Thanks Spirit Juice! Our group arrives today. This exquisite little video shows why they decided to fly over the Atlantic to join us in the God’s country – literally, the land of Israel. We are now walking in the footprints of God! Join us later this year on a Footprints of God pilgrimage before they fill up. We only take smaller, one bus trips now — for your comfort, intimacy and to be the best pilgrimage possible. You could call it the “boutique pilgrimage” for those who want the best Catholic experience possible. What a great arrival! Fifty pilgrims arrived at Ben Gurion Airport in Tel Aviv and off we went north to Tiberias to begin our adventure following Our Lord Jesus through his own land. 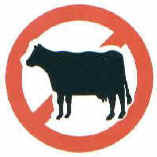 Stop Eating Animals! It is Against the Plan of God! IF YOU EAT ANIMALS YOU ARE VIOLATING THE PLAN OF GOD. YOU SHOULD BE A VEGAN AND EAT NO ANIMAL PRODUCTS, INCLUDING FISH, EGGS, MILK, YOGURT, LOCUSTS OR MEAT. IS THIS **REALLY** GOD’S PLAN? “One more comment about ascetics who supposedly ate a vegan diet. In modern terms, they were not vegans. Veganism today is usually not simply a simple diet but an ideology which says that eating meat is cruelty, exploitation of animals and is morally wrong. Christian ascetics ate a simple diet as a form of fasting and penance. They did NOT avoid eating because they thought eating an animal was immoral. To do so would be to say Jesus had acted immorally. They avoided meat because it was an extravagant pleasure. Just as they would not wear a mink coat because it was an extravagance, so they did not eat meat because it too was considered – not a sin or immoral act – but an extravagance. For most of history meat, like a fur coat, was an expensive indulgence of the rich.